While physics and physics-based disciplines adequately describe the non-living, there is a need for a complementary perspective that captures the essence of life. Biology and neuroscience could provide such a perspective, provided that they are not practiced as yet another form of physics. Of course, an authentic and effective complementary perspective can only reaffirm materiality and the associated dynamics that physics, or for that matter biology, explores. But it has to also account for the specific causality characteristic of life by integrating past, present, and future. Experimental evidence and empirical knowledge attest that there is no intentionality in the realm covered by physics and physics-associated disciplines. In contradistinction, the living is always characterized by what an observer could only describe as goal-oriented behavior. Current biology and neuroscience either end up explaining this behavior in terms specific to physical determinism, or simply leave anticipation out of the larger picture. The publication (over 20–30 years later) of Robert Rosen’s Anticipatory Systems  and Mihai Nadin’s Mind – Anticipation and Chaos  resulted in a similar situation in the science of the “free” world. Outside the echo chamber of “official” science (as sanctioned by funding agencies), there is little a scientist can do in order to ascertain new ideas and concepts. Robert Rosen was already a “thorn” in the side of the “high priests” of a science of the living aligned with determinism—the sacrosanct dogma. As a newcomer, I earned the complicit indifference of those whose views were challenged by my work. Nevertheless, there is currently a rapidly growing interest in understanding how anticipatory processes take place, and what the practical implications of this understanding might be. Not surprisingly, some researchers are rushing in the direction of institutionalizing this interest in the hope of making it theirs, even in terms of institutionalized support. When cats and athletes teach robots how to fall, and when a patent protects the technology that guides the falling of the iPhone on its display, anticipation starts making a difference. Moreover, predictive computation is making inroads, creating an interactive environment that facilitates anticipatory behavior (Nadin ). The Hanse Institute for Advanced Study hosted my research (during the 2011–2012 academic year), acknowledging early contributions I made to the foundations of the discipline. The Institute for Research in Anticipatory Systems at the University of Texas at Dallas cooperated in the undertaking, and so did Dr. Otthein Herzog (Director, Technical Center for Informatics, University of Bremen; professor, Visual Information Technologies, Jacobs University) and Dr. Christian Freksa (professor, Computer Science, and Director, Cognitive Systems Group—CoSy, University of Bremen). I took note of the genuine desire of other Fellows at Hanse, and of scientists who participated in seminars and colloquia, to have the opportunity to learn more about the science of anticipation. Where there is thirst for knowledge, one has to provide for satisfying it. 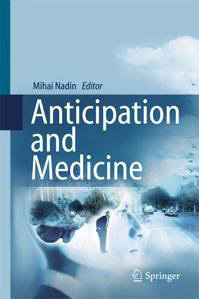 As the subject of anticipation claims its legitimate place in current scientific and technological inquiry, researchers from various disciplines realize the need to integrate an anticipatory perspective in their research. Therefore, I suggested to Hanse that a Study Group be established, and assured the long-term cooperation of the Institute for Research in Anticipatory Systems. The volume you have in your hands (or read on your eBook device) is but one outcome of the activity of this Study Group. 1 What Is at Stake? The first two have already taken place. The third is, at the time of this writing, in the advanced stages of preparation (it will take place September 28–30, 2015). Cross-modal validation is of extreme importance in science. If anticipation were only a tempting theoretic perspective, chances are that it would not continue to attract researchers or justify the support of society. But this is clearly not the case. The major crises of the last ten years (financial, ecological, social, medical, and even moral) illustrate the urgent need for an anticipatory perspective. We cannot afford to ignore, for example, the questions pertinent to sustainability—a major global challenge. Leading scholars in economics, energy research, oceanography, engineering, and behavioral sciences worked with us in preparing a two-and-one-half-day-long conference. We provided a forum for 22 researchers to exchange experiences in respect to particular aspects of anticipation. Doctoral candidates and post-doctoral scientists were also present. The hope is to trigger future work on the subject by having well-defined projects carried out by scientists working in the defining spirit of interdisciplinarity implied by anticipation. During the conference, a distinguished researcher (Dr. Johann Hoffmann, emeritus, Würzburg University) made note of the fact that I was able to engage scholars usually focused on their own tightly defined area of interest (the “specialization” syndrome) in an interdisciplinary effort without precedent: “I’ve never experienced such a successful interdisciplinary effort.” A compliment like this would go unmentioned were it not for the fact that if anticipation, as a subject in its own right, should eventually succeed, it will be on account of cross- and inter- disciplinarity. The conference occasioned an exchange of knowledge and data of a very large scope: from an art event (documented in this book) to experiments in neuroscience, design of power networks, anticipatory expression in plants, anticipation in politics, and anticipatory computing. Contrary to stereotype, I shall not summarize contributions made within the conference. Rather, I am taking advantage of the opportunity to suggest a number of applications in the hope that they will eventually become part of the new anticipation-endowed reality. For over 300 years—since Descartes’ major elaborations (Discourse on Method, 1637 and Principles of Philosophy, 1644) and Newton’s Principia (1687)—science has advanced the understanding of the reactive characteristic of the physical world, expressed in the cause-and-effect sequence. The corresponding reductionist view-point states that a machine can represent the functional characteristics of reality, including the functioning of the human being. The assumption of homogeneity (“All electrons are the same,” someone once said) is implicit in physics. In the living there is no such identity. Computer programs (“soft machines”) are descriptions that capture details of a homogenous reality that has escaped all previous machines. Programs express these details in many ways: from visualizations of data to intelligence-like inferences, to procedures for automating the execution of complicated, yet well-defined, tasks (the domain of robotics, for instance). However, in describing the living, regardless of its complexity—from monocell to the whole human being—descriptions based on the deterministic understanding of the world and the corresponding reductionist model fail to capture the defining characteristic of life: the ability to anticipate. The living is infinitely heterogenous (there are no identical cells, not to say identical neurons) and variable. 1. An anticipatory system is a system whose current state depends not only upon a previous state, but also upon a future state. 2. An anticipatory system is a system that contains a model of itself that unfolds in faster than real time. but also upon possible future states. Please take note of the possibilistic dimension introduced through this definition. The process through which anticipations are generated might indeed rely upon faster-than-real-life unfolding models, but alternate possibilities, similar to quantum entanglement, should also be considered. Of course, we have to address a critical question: can such definitions serve as a basis for conceiving, designing and implementing anticipatory computing? The more constrained a mechanism, the more programmable it is. Reaction can be programmed, even without computers. Although there is anticipation of a sort in the airbag and the anti-lock braking system in cars, these remain expressions of pre-defined reactions to extreme situations. In programming reaction, we infer from probabilities (a shock will deploy the airbag, sometimes without cause) always defined after the fact (collisions result in mechanical shock). They capture what different experiences have in common, i.e., the degree of homogeneity. Proactive behavior can to some extent be modeled or simulated. If we want to support proactive behavior—prevention, for instance—we need to define a space of possibilities and to deal with variability. We need to afford interpretations (e.g., an accidental shock that does not require the airbag should be distinguished from a collision). To infer from the combined possibility-probability mapping of the information process describing the dynamics of reality to anticipation means to acknowledge that deterministic and non-deterministic processes are complementary. This is especially relevant to information security (and to security in general) since it is not in the nature of the computer—a homogenous physical entity—to cause security breakdowns. Rather, it is in the nature of those involved in the ever-expanding network of human interactions—a heterogenous entity of extreme variability—to express themselves in a manner that can be qualified as destructive. Hacking, for example, can be demonized or seen as an expression of creativity. Anticipation can have many explanations. 2. to develop hybrid computational mechanisms that integrate physical and living components, with the aim of achieving effective anticipatory properties. Information Security and Assurance will become an ever more elusive target within the reactive mode of computation in which it is practiced today. Every step towards higher security and assurance only prompts the escalation of the problem that gave rise to such steps in the first place. In order to break this cycle, one has to conceive, design, implement, and deploy anticipatory computing that replaces the reactive model (such as virus detection) with a dynamic stealth ubiquitous proactive process distributed over networks. Anticipatory computation, inspired by anticipation processes in the living, implies a self-repair component. It also involves learning, not only in reaction to a problem, but as a goal action-oriented activity. The human immune system, which is anticipatory in nature, is a good analogy for what has to be done—but it also shows how difficult the task is. In some ways, anticipatory processes are reverse computations. Therefore, an area of anticipatory computing research will involve experiments with reverse computation (limited, of course, by the physical substratum of the computation process, i.e., by the laws of thermodynamics), either through quantum computation implementations or through hybrid computers (with a living component). Anticipatory computing is indeed a grand challenge. The ALife community could not deliver a comprehensive view of change because it failed to acknowledge the role of anticipation. The swarm metaphor was a step in the right direction, but not pursued by any relevant research. The current efforts of leading scientists and research centers (e.g., Intel’s involvement in proactive computing, the work of the Department of Energy’s Sandia Laboratory, IBM’s efforts) support the claims I made in 1998—anticipation is the new frontier in science—and in 2000—anticipation is the second Cartesian revolution. This work, of extreme significance, is dedicated to the description of complex forms of causality characteristic of the living, rather than those associated with determinism and reductionism (the domain of the Cartesian model of the world). Most research in our days, which I wish to acknowledge (and which is often spectacular), is frequently carried out with no understanding of the fundamentals of anticipation. The technical aspects of anticipatory computing extend well beyond the subject of the “predictive devices” that “know” when you have a flight (because you booked it through one of your devices) and order a taxi for you so that you can arrive at the airport on time. It might well be that in addressing information security, we simultaneously address the fundamentals of current computation, intrinsically unsecure. Climate changes, variations in the financial markets, shifts of all kind in ecosystems, and even the state of the human body are preceded by various signals. The problem is that most of the time we have no idea what such signals are. And even if we have some intuition as to what they might mean, we do not have consistent ways to infer from such signals to the future. Indeed, anticipation is not some kind of symptom, it is rather an encompassing expression, most of the time very close to the event we would prefer to know about in advance. Obviously, it would be beneficial to foresee transitions. This is notoriously difficult but within the scope of anticipation studies. The conference approached this applied research perspective. Science and technology continue to impact our existence. To be blind to what has changed in the world in recent years, and how such changes are shaping a new human being is almost impossible. Blindness itself is in the process of being overcome through technology. But there is another form of blindness that is actually not decreasing: blindness to the consequences of change. Today we have a better understanding of atomic energy than we did in the early 1950s, but many forget about the time when it was fashionable to wear a heart implant driven by an atomic battery. Without any desire to demonize any of the new opportunities, we still have the obligation to understand their short- and long-term consequences. This is not the place to dignify the daily scare messages associated with what it means to stare at a monitor, to be dependent on a cellular phone, to experience the loss of privacy, to face the medical consequences of trading physical activity for the passivity of uninterrupted entertainment. The conference took note of the fact that from a reaction-based perspective, more data (“Big Data”) makes sense and promises many revelations. From an anticipatory perspective, it is probably meaningful to minimize data to what is necessary and sufficient in order to describe a process. To derive banality from big data is quite different from deriving meaning from significant data. The conference documented in this book took note of the fact the reactive approach to virus prevention, whether in immunopathology (e.g., Ebola, West Nile virus, avian flu) or in computer malware (e.g., Conficker, nVir, Stoned), is extremely expensive and marginally efficient. Self-inflicted vulnerabilities are the expression of the lack of anticipatory awareness. This extends to social and political life. In view of such observations, this was a good conference. Discussions, not recorded for this or any other publication, occasioned exchanges of ideas which will, I am sure, benefit all participants. The entire support structure in place at the Hanse Wissenschaftskolleg/ Institute for Advanced Study functioned error free. Dr. Dorothe Poggel, at times overwhelmed by the scale of the event, made sure that the program was flawlessly executed. Dr. Monica Meyer-Bohlen and Wolfgang Stenzel, working with Lada Nakonechna offered the opportunity of opening up the discussion in the domain of aesthetic activity. For their contributions to this publication, gratitude is owed to Asma Naz—she herself a much appreciated contributor to the conference. Elvira Nadin, also a contributor, worked hard in the organization of the session as well as in the preparation of the manuscript for this book. Last but not least, the Deutsche Forschungs Gemeinschaft, Hanse Institute for Advanced Study, antEÌ— Institute for Research in Anticipatory Systems, the University of Texas at Dallas, and the Political Anticipation Network provided funding and other support, without which neither the conference nor this volume would have been possible.